There are well known problems with Android OS and the reported maximum battery capacity. This maximum battery capacity is used by android OS to know when the battery is fully charged. Advanced Battery calibrator will fix this problems and make Android OS see your real battery capacity allowing it to be charged to its real full capacity. Advanced Battery Calibrator works specially well with its sister app "Battery Life Repair" and it has been designed to take full advantage of it by sharing information between both applications. If you want to keep your battery healthy use both applications and take advantage of its integration. 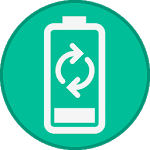 Calibrate your battery today with the top one application on the store and experiment a real improvement on your battery. Similar to "Advanced Battery Calibrator"